When dining out or choosing a bottle from a liquor shop, what would you pick to have with your meal? If you’ve always gone with your favourite varietals, guided by the simple formula of pairing reds with meat or game and whites with seafood, you might want to consider something less rigid or conventional. Why sake, you ask? Well, like the curse of typecasting Western wines once endured, many often think sake only goes with Japanese food. This is not true. In fact, it’s versatility is one of its most overlooked qualities. Sake is made using parallel multi-stage fermentation, which is unique to East Asia. Fermentation of fruit wines is dependent on the sugars inherent in grapes, but rice, which is used to make sake, only contain starch—so there is also the need to do saccharification (the process of breaking a complex carbohydrate into sugars), then fermentation turns the sugar generated from starch into alcohol. Also unique is the fact that these two reactions are happening at the same time, so as to achieve a high alcohol content. This procedure generates more umami compared to Western wine. In contrast, because sake is made from grain, it is usually low in acidity resulting in a very smooth drink that goes with a wide variety of foods. It also brings to the table added umami and a natural sweetness to the dish. Of course, there is nothing wrong with pairing white wines—and even selected reds, depending of the dish—with seafood. But if you have struggled with your wine tasting a little fishy, there is a good explanation, involving the oxidation of DHA and EPA found in seafood, the resulting peroxide lipid, and its reaction to iron found in wine (which is generated by the high mineral content of the soil). These reactions lead to the formation of 2,4-Heptadienal, which is the source of fishiness. 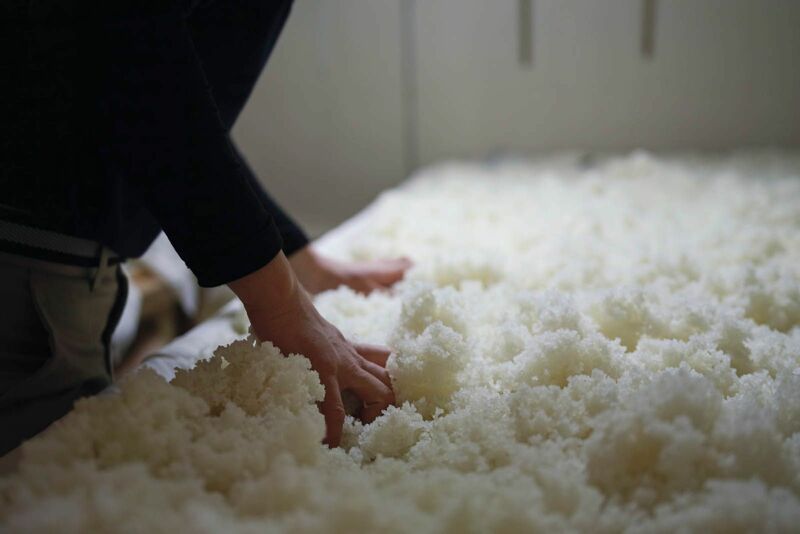 In contrast, traditional sake making uses soft water that is low in mineral content. Iron in particular is avoided as it will ruin the quality of sake. As such, iron content in sake is customarily very low. Similarly, it is said that meat and red wine is the best combination. But, nowadays, people are starting to pair their food and wine more freely. And if we take what we’ve learned about sake, we can understand why its complementary qualities make for an equally wonderful pairing, allowing the different dimensions of meat to shine. And let’s not forget, it offers more umami compared to wine, and can add another layer of umami to the experience. Some wine connoisseurs might argue that red wine contains tannins, which is important as it helps to cut through the fattiness and cleanse the palate. But so can sake. Water is often added to sake before bottling, mainly to bring the alcohol level— which can be as high as 22 per cent—down to about 15 per cent. But there is a variety of sake called ‘genshu’, which is bottled without added water. This has a relatively high level of brewed alcohol; wine generally contain seven to 14 per cent. But it is the high alcohol content in ‘genshu’ that allows it to cut through the fattiness of the meat. To boot, some sake breweries have even started making sake that contain more acidity, which will also work to cleanse the palate. Suffice it to say, sake goes with Asian cuisine relatively well; it is after all made from rice—a staple of Asian cuisines. But sake also goes with spicy food. The roundness of its flavour profile complements the kick from the spiciness. Fruity, floral, light and refreshing, these range from sweet to dry and boast a wide variety of flavours. They’re a bit like white wine, and pairs well with Western cuisine. It makes a fine pre-prandial toast, and as an accompaniment to simple steamed or grilled fish, seafood salad, cured or marinated raw salmon, as well as refreshing dishes that use citrus flavour. Recommended serving temperature is eight to 15 degrees Celsius. This variant is usually low in alcohol content and features a low aromatic profile that makes for easy drinking and pairing with a wide variety of food. This is an everyday, casual sake—an all-rounder. Recommended matches include simple and pure flavours such as sashimi of white fish, boiled crab, soba and chilled tofu. Recommended serving temperature is five to 10 degrees Celsius. This is considered the most traditional style of sake. It matches perfectly with Japanese cuisine and also goes well with rich Western and Chinese cuisine, especially dishes with creamy flavours or those that use cream or butter sauce. It also pairs well with hotpot, and sweet and savoury flavours such as braised beef and potato with soy sauce and mirin. Recommended serving temperature is 15 to 20 degrees or if served warm (kan zake), at 40 to 55 degrees Celsius. This sake type is rich in amino acid, high in alcohol content, acidity and sugar level. It goes with rich flavours, especially aged ingredients. It also goes well with oily, rich, smoky food, and dishes that use a lot of spices such as sautéed foie gras, grilled eel, aged cheese, and chilli crab. It can also be enjoyed as a digestif. Recommended serving temperature is 15 to 25 degrees or if served warm (kan zake), 35 degrees Celsius.